NEXT MEETING - Click here to read next meeting agenda scheduled for 4/10/2019. CALL TO ORDER: Chair Randolph Hack called the meeting to order at 7:00 p.m. Quorum WAS ESTABLISHED with nine (9) members present. Note - This 13-member board requires seven (7) members to establish a quorum and to take official Board action. Board Members Present: Barbara Armentrout, Will Caron, Frank Farm, Josh Frost, Paul Holtrop, Beverly Mau, Earl Shiraki, and Darlene Nakayama. Board Members Absent: Bradley Rentz, Rusti Onishi, and Jaime Rincon. Guests: Captain Takada (Honolulu Fire Department); Lieutenant Gary Sunada (Honolulu Police Department); Dominic Diaz (Board of Water Supply); Director Ross Sasamura (Mayor Kirk Caldwell's Representative/Department of Facility Maintenance); The Department of Design and Construction (DDC) Director Robert Kroening; Department of Commerce and Consumer Affairs (DCCA) Director Catherine P. Awakuni-Col�n; Cliff Kaneshiro (Councilmember Ann Kobayashi's Office); House Representative Calvin Say; State Senator Les Ihara; (Residents) Jr. Traver Carroll, Jackie Carroll, Jay Chivers, Maribeth Samiento, Elton Fukumoto, Carol Lee-Arnold, Wainani Arnold, Grace Lee, George Lee, Pritty Borthakur, Dulal Borthakur, Jason Arakawa, Liare Arakawa, Aurelia Gonzalez, Freedom Dennis, Roya Dennis, Dave Watase, Kahealani Kaehi, Kehau Lianos, Evan Anderson, David Farrell, Philip Tom, Cory Kot, Syndney Lynch, Maelyn Chang, Bruce Shimokawa, Martha Torney, Ashley Noji, Keoki Noji, Shirley Murakami, Rose Chismar, Tae Kim, Drew Matsumoto, Sandra Staab, Daryn Shima, Ann Harada, Howard Caires, Tracy Caires; and Thomas Baldwin (Neighborhood Assistant). February 2019 Statistics: There were 1 cooking fire, 1 activated alarm, 24 medical calls, 1 motor vehicle collision involving a pedestrian, 3 mountain rescues, and 1 hazardous materials incident. Safety Tip - Fire Sprinklers: Fire sprinklers respond quickly and effectively to a fire. Fire sprinklers can save lives and property, reducing fire deaths by 83% and reducing property damage in homes by 69%. 1. Rescue Reimbursement: Shiraki asked and Takada responded that the rescues occured at Kaau Crater Trail. He commented that Bill 248 involves rescue reimbursement. HFD considered rescue fees, but decided not to pursue that option as it could disincentive hikers from calling for rescue in a dangerous situation. Shiraki responded that, in life threatening situations, hikers would still opt to call for rescue despite the fees. 2. Smoke Alarms to Seniors: Armentrout asked and Captain Takada that the HFD still offers a program to provide smoke alarms to seniors. 3. House Fire Causes: Shiraki asked and Captain Takada responded that every house fire has variable causes, which are investigated and reported on a case by case basis. 4. Kuahea Street Emergency Access: A resident of Kuahea Street asked and Captain Takada responded that a nearby hydrant to Kuahea Street and Kuahea place would enable the HFD to walk hoses to emergency areas in the case of a fire. February 2019 Statistics: There were 3 motor vehicle thefts, 14 burglaries, 16 thefts, 6 unauthorized entry into motor vehicles (UEMV), and 5,738 calls for service. Safety Tip - Emergency Vehicles: Lieutenant Sunada advised residents to make a clear pathway, or slow down below the speed limit if the former is not impossible, for emergency vehicles. 1. Crosswalk Parking: Shiraki asked and Lieutenant Sunada responded that cars must park 30 feet away from a crosswalk. He recommended calling HPD to make a determination for vehicles potentially in violation. 2. Repainting Liens on Waiomao Road: Resident Philip Tom of Waiomao Road recommended new lines on Waiomao Road ought to be realigned. Chair Hack recommended it be referred to the City. 3. Squatters on Kuahea Street: Resident Kehau expressed concerns with squatters residing in three (3) condemned homes on Kuahea Streets. Lieutenant Sunada recommended calling them if they are spotted. It was reported that the squatting individuals move frequently, making it difficult for HPD to enforce. Main Break Report: Five (5) breaks on Kuahea Street and 1 break on Waiomao Road. Water Rate Update: At its August 2018 meeting, the BWS Board of Directors adopted a new five (5) year water rate schedule. The schedule started in September 2018, but adjustments to the rates and tiers will not become effective until July 1, 2019. The new rates will allow the BWS to continue to provide safe, dependable, and affordable water to the one (1) million people we serve on Oahu now and into the future. To inform customers about the new rate schedule, BWS will mail all customers a flyer containing information that will help explain teh changes and prvide examples of average bills. A copy of this flyer is being provided at neighborhood board meetings, and is also available online. Full details on the new rate schedule is available at www.boardofwatersupply.com/waterrates. 1. Kuahea Street: Resident Ashley Noji expressed concerns that the main breaks are far more frequent than reported. She commented that, within the last month, there were only four (4) days that a water main break did not occur on Kuahea Street. Resident Noji added that, after the pipes were fixed, they are dealing with low water pressure and dirty water from their pipes. Diaz commented that he will take the concerns back. He commented that the recorded breaks represent the breaks along the water mains. In this situation, the service laterals to the homes might have leaks. These do not show up in the main break record. Chair Hack asked, and Diaz responded that laterals are the lines that run from the main to residential home/meter box. These do not qualify as a main. Resident Noji commented that the main breaks seem to be coming from the middle of Kuahea Street, and requested this be considered in the follow up. 2. Waiomao Road: Resident Jason Arakawa on Waiomao Road expressed concerns with water seeping in the property, believing its from the water main breaks. He commented that BWS tells them that this is not from the water main breaks. He added that, in the meantime, they continue to see water on their property damaging their driveways. He asked what the BWS methodology is to determine breaks. Diaz responded that he would have to go back, as there is an investigation group that determines main breaks. He commented that some of the methodology includes sounding or physically inspecting the mains, clarifying that he is not sure what method was used. Resident Arakawa commented that with the lack of rain and frequent visits by BWS, he believes there is a water main break somewhere along Waiomao. 3. Kuahea Street (continued): Resident Jay Chivers expressed concerns with the BWS quality of work following an inch and a half pipe break that resulted from a lack of solder to seal the pipe. 4. Water Main Breaks Meetings: Nakayama requested BWS to arrange regular meetings with the residents of Kuahea Street/Place and Waiomao Road considering the recent surge of issues. Diaz responded that he would take the request back. Shiraki reiterated the concerns. Diaz responded that they are committed to finding a permanent fix that works. They have an interest in solving the problem as well. 5. Kuahea Street (continued): Resident Corey Kot expressed concerns following his observation of problems with the lines he observed while work was conducted recently on Kuahea Street. He commented that three (3) feet of water was present in a hole on Kuahea Street. He then reiterating the previous concerns from the residents. Resident Pritty expressed her appreciation to Resident Kot's efforts. She expressed concerns with the degradation of the road and surrounding neighborhood. She requested a monthly report be distributed to the residents concerning the quality of the available water. 6. Waiomao Road (continued): Resident Pritty expressed concerns that Waiomao Road is sliding. She commented that water in the earth may be contributing to the earth movement. 7. Historic Concerns and Stormwater Management: Resident Gonzales expressed her concerns that BWS has not been more diligent in addressing the concerns from the residents of Waiomao/Kuahea. She added that there were historic concerns with the area showing risks of landslides that the City and BWS should have and ought to prioritize. She asked what infrastructure would be put in place to meet the demands of stormwater management. Diaz responded that Palolo is a part of the Primary Urban Core Watershed, adding that they recently released their preliminary watershed management plan for comment to government agencies, and will be released to the public for comment and review. In terms of stormwater management and infrastructure, he responded that those questions ought to be referred to the City, as BWS only handles potable water. 8. Preliminary Plan: A resident asked and Diaz responded that he would report back with an expected date to publicly release the preliminary watershed plan for public review. 9. Issues with Water and Earth Movement: A resident expressed concerns with discussions around Waiomao Road and Kuahea Street being isolated to either discussing the water or discussing the earth movement separately. He commented that these issues are connected and ought to be discussed together. He described previous concerns with the earth movement affecting the residents and property of Waiomao Road and Kuahea Street. Shiraki echoed these sentiments, expressing concerns with the earth movement. Hearing no objection, Hack moved to hear the report from Mayor Kirk Caldwell's representative. Mayor Kirk Caldwell's Representative: With the approval of Chair Hack, Department of Facility Maintenance (DFM) Director Ross Sasamura deferred the Mayor's report to follow questions related to the concerns with Waiomao Road and Kuahea Street. ??? History of Earth Movement: Director Kroening reported that the problems residents state are caused by earth movement. He apologized that the City has not communicated more effectively. He commented that uncertainty surrounds the situation, commenting that the recent surge in earth movement over the last few months was not expected. He commented earth movement has been monitored since the 1950s, but not to the degree seen recently. He added that, prior to the earth movement, there were projects scheduled related to this area. He reported that they previously planned to develop and stabilize the road within the right of way based on the level of earth movement consistent with that seen over the last several decades. He added that, following recent developments, DDC no longer had the capabilities to protect the road within the right-of-way, needing more space to create a proper solution. Current Situation: Director Kroening reported that maintaining access to the area is a city responsibility. With the current earth movement, they cannot reasonably maintain access to Kuahea Street. To maintain Waiomao Road, the City acquired three (3) of the properties to better position the City to alleviate the situation. He reported that they have initiated emergency contracts to alleviate and maintain the road to be opened. In regards to the street and sidewalks damage, teams have either repaired or removed damaged sidewalks and leveled out the bump on Waiomao Road. He added that they do not plan to remove the bump at this time, believing that the bump is part of the weight keeping the road in place. He commented that any damage that occurs in the near future will be attended to. Kuahea Street Project: Director Kroening discussed their project to alleviate and stabilize the right-of-way of Kuahea Street. He reported that the plan involves driving large piles into the ground along Kuahea Place and Kuahea Street, install more substantial retaining walls, and level out some of the present earth to reduce pressure on Waiomao Road. He commented that adjusting for the natural earth movement is a significant challenge. He reported that the solution proposed appears to be the most effective solution and would begin four (4) months from this meeting assuming no further significant problems occur. 1. Walkway: Shiraki expressed concerns with the condition of Kuahea Place, and requested a walkway be created to alleviate the situation for the residents. He expressed concerns with the injuries that could be sustained by residents trying to navigate the road. 2. Underground River: Chair Hack asked if it were possible to dyke or divert the underground river in the area, and Director Kroening responded that it is not widely believed that a river runs under the area, adding that he does not believe dyking such a river would likely not be a practical solution. He commented that the earth movement is likely due to the recent intense rainfall. 3. Kuahea Place: Resident Noji requested more regular updates from DDC to either the Board meetings or directly to the residents. She commented that the City is looking to do an assessment of a retaining wall that used to sustain Kuahea Place, adding that the road has crumbled in the interim. She described the extreme measures residents have taken to navigate to and from their homes at Kuahea Place, stressing that this poses an even greater risk for seniors. She requested some emergency efforts to stabilize the road in the interim. 4. Proposed Solution: Farm asked what level of confidence the City has that the proposed solution will significantly alleviate the earth movement in the area. Director Kroening responded that he is 100% confident that the work will have some effect to somewhat stabilize the area, adding that he is 80% - 85% confident that the planned work will significantly stabilize the area. He added that there uncertain variables with nature in the next several months that and into the future that could change that. Farm commented that these concerns have been discussed for a long time. 5. Waiomao Road: Resident Lehua expressed concerns with the growing dip, sinkhole, and cracks along Waiomao Road. She commented that there is only one (1) way into and out of Waiomao Road, commenting that this not only significantly impacts the daily lives of residents but also poses a greater risk to senior citizens in the area should any need medical attention. Director Kroening responded that, according to their assessment of the road, they do not foresee any significant damage to the road that would require its closure so long as its maintained. He added that many engineers are assessing the road weekly to ensure the stability of the road. Resident Lehua expressed concerns with the condition for drivers, and Director Kroening responded that he agreed that it would be time to return and readjust the significant damage on the road. 6. Walkway (continued): Shiraki reiterated his request for a walkway along Kuahea Place. 7. Outreach: Holtrop requested the neighbors be updated as the project progresses. Director Kroening responded that they will keep the community and Board apprised of the project as it develops. 8. Emergency Scenario: Holtrop asked what emergency plans they prepared in case significant earth movement occurs within the next four (4) months that. Director Kroening responded that the current project, it will occur within the properties they purchased, which would allow them to start within City land. He commented that if it becomes necessary to acquire more land to ensure the project continues, they will work towards that. 9. Water Issues - Contact: Armentrout advised present residents experiencing water problems to provide their contact information to the BWS and City representatives for follow up. 10. Alternative Sources: Resident Bill Chismar commented that, according to Geolabs, there was limited earth movement in the area since the 1950s localized around the quarry. He added that Waiomao and Kuahea are on the other side of the mountain from the quarry, distant from the history of observed earth movement. Resident Chismar commented that, since his residence in the 1990s, there have been no movement in this area until 2006 rains. He commented that it was likely something due to the drainage of these rains underground is likely the cause of this movement. He asked if anyone has done a survey of the land above Kuahea Place to explore this concern. He expressed concerns that the plan would not be effective if it is not addressing the root causes. Director Kroening responded that he will take back the recommendation to divert water from above, as has been done in other places. He clarified that, as of right now, the root cause of the issue is still unknown. He commented that the most reliable observation is that the land shifts more following heavy rainfall. Resident Chismar recommended that they meet with the residents, who have their personal testimony as to when the movements occured and to what degree. Resident Martha Torney, echoing the sentiments of the previous resident, expressed concerns that the project may not be effective if it does not take into account the larger trend of earth movement and its causes. 11. Kuahea Place (continued): Kehau commented that their family has lived in Kuahea Place for over 50 years, without these issues being apparent. She described the property damage sustained due to the drastic earth movement, commenting that they and other residents are moving out in response. She added that many long-time residents are now finding places to rent. She urged the City to take their observations and situation seriously, adding that the City made the irresponsible choice of allowing residents to unknowingly build in an area susceptible to earth movement. 12. Waiomao Road and Kuahea Street (continued): Resident Beth described the property damage sustained by her property. She commented that, following an advisement from the City, she filed two (2) separate complaints online with no response. She expressing her concerns for the safety of the residents. Resident Philip Tom reiterated these safety and property concerns. He added that in 2016, there was work on Waiomao Road that a contractor walked out on. He commented that issues of earth movement and road damage on Waiomao followed this event. He asked and Director Kroening responded that the contractor went out of business and another company was hired to finish the job. He reported that the significant earth movement began in that time, making that project untenable. That company was able to finish some work, including storm drain work and repaving on Kuahea Street. Resident Tom asked concerning the storm drain project on Waiomao Road and Director Kroening responded that he was not immediately familiar with that specific project. 13. Proposed Solution: Resident Tom asked and Director Kroening responded that their planned project has a tentative rough cost of up to $20 million. Resident Tom asked and Director Kroening responded that they do have the necessary soils reports to conduct a project of this scale, commenting that he is not sure what the process would be to make those reports open to the public. DFM Director Sasamura commented that residents would need to require a request into the City for the information. 14. Geolabs Report: Resident Noji commented that they formally requested the 2015 Geolabs report. She commented that, with the monitoring equipment still active, the reports since then would be invaluable to the community. Director Kroening responded that they will provide all documentation available. Resident Noji asked and Director Kroening responded that he is not sure if there are Geolab reports available since 2015. She responded that they have been told that no reports exist, adding that the community strongly believes those reports exist. 15. Kuahea Place: A senior resident described her personal challenges with going up and down the road as well as the difficulty at night with the inactive street lights. 16. Geolabs Reports (continued): Director Kroening commented that, due to several lawsuits, the information related to the later Geolabs reports likely could not be provided. Resident Noji expressed concerns that only those filing a lawsuit against the city have access to the Geolabs reports. She observed that, considering the serious nature with the earth movement, property damage, significant damage to the right-of-way, and potential injury for those trying to navigate their community, residents severely affected by these problems who want access to that information have an incentive to file a lawsuit with the City. She commented that this information is needed by the residents. 17. Alternative Solution (continued): Resident Pritty urged the City to work with the community to find the underlying problem, commenting that the City ought to explore the possibility of underground water. She commented that some areas of the community lack necessary water drainage infrastructure. She requested additional solutions be explored. Shiraki agreed with the concerns with water flowing underneath the community. 18. Emergency Declaration: Nakayama asked if the City could consider calling the natural disaster a state of emergency, citing the condition of the road and sidewalks, sinkholes, the drastic measures residents take to travel to and from home, the unhealthy water and the significant property damage. She commented that the health and safety of the residents is at risk. DFM Director Sasamura expressed appreciation for the community's engagement with them, adding that their comments and testimony are well taken. He clarified that the "sinkhole??? was actually a boring hole left unfilled by HECO. Responding to requests for a state of emergency, he commented that neither he nor Director Kroening have the authority to call a state of emergency. He commented that there are clear problems that every resident of the area needs addressed. He recommended the residents research Bill 11, the City and County of Honolulu's Capital Improvement Project budget. He commented that they are seeking 1.5 million dollars for the Kuahea Street project, funds the DDC needs to continue the project. He concluded that those interested in this issue may be inclined to testify in support of the line item. 19. Walkway (continued): Shiraki reiterated his request for a walkway for residents of Kuahea Place. Director Sasamura responded that the request will be taken into consideration, clarifying that they have limits as to what they as public officials can do on private property. He commented that they would need to explore legal solutions before implementing such a solution. Citing time constraints, Chair Hack requested that continued discussion with the Directors be taken offline. Hearing no objection, Hack moved to Filling of Vacancies on the agenda. No residents volunteered to fill the vacancy in sub-district four (4). Council Chair Anne Kobayashi's Office: Cliff Kaneshiro of Council Chair Kobayashi's Office was discussing matters related to Kuahea Place and Waiomao Road with the Directors and residents at this time; a newsletter was distributed. Governor David Ige's Representative: Department of Commerce and Consumer Affairs (DCCA) Director Catherine P. Awakuni-Col�n distributed and highlighted items from the newsletter, including Governor Ige's proposed pre-K initiative, tax filing tips ahead of the April 20, 2019 State Tax deadline, as well as advisement to the community to provide comments on legislation that are to be considered by the Governor's Office. Maili Road Resident Concerns: Representative Say reported that they are working towards a solution for the issue related to albizia trees falling on HECO telephone pole. Waiomao and Kuahea: Representative Say reported that he met with Director Kroening and the Department of Health (DOH) regarding the threat of sewer line breaks facing Waiomao Road. He commented that the general issue affecting Waiomao and Kuahea is a long standing issue that affects the surrounding residents, including those on 10th Avenue Place. He commented that he plans. ?? 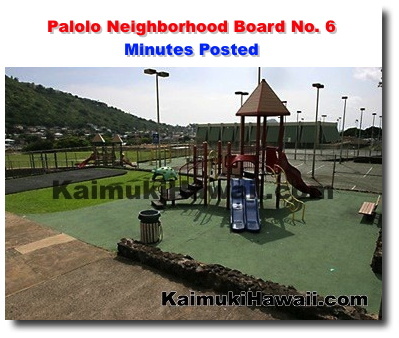 General Palolo Concerns: Representative Say reported on general concerns, including the continuing Palolo sewer project is continuing, a recent homeless camp at Kaau Park, and feral chickens in the neighborhood. Ala Wai Canal Project: Representative Say reported that there is no Ala Wai Canal Project until the appropriation is finished and the City and the State come together with an Memorandum of Understanding. He added that there will be a public hearing at the State Legislature on Senate Bill 77, related to appropriating funds for the Ala Wai Canal Project. 1. Recreational Marijuana: Shiraki asked and Representative Say responded that he voted no on the recreational marijuana bill. 2. Bail Reform: Shiraki asked and Representative Say responded that he supports low- or no-bail reform. He clarified that it's necessary to help relieve prison overcrowding. He added that there are difficulties related to expanding Halawa. 3. Sanctuary Cities: Shiraki asked and Representative Say responded that, while the Sanctuary State bill died in the Legislature, he supports the idea. Say clarified that Hawaii, a state with a unique history of immigration, ought to provide opportunities for sanctuary to other immigrants. 4. Ala Wai Canal Project: Resident Sydney Lynch commented that there will be an informational meeting on the Ala Wai Canal Project. She commented that there are now site inspections approved by the BLNR related to the project. Representative Say commented that he will take the concern back. A resident asked and Representative Say clarified that he has not voted on Bill 77, as it recently came over from the Senate. Senator Les Ihara Jr.: Senator Ihara reported the following: Senate Bill (SB) 77: Senator Ihara reported that he amended SB77 on the floor of the Senate to make a defective date. He added that there is no current funding commitments in the language of the bill. He voted for the amended bill with reservations. He reiterated Representative Says comments regarding the MOU. He commented that the United State Army Corps of Engineers (USACE) have provided the plan, and cannot move forward without the State and City committing to the project. Senator Ihara commented that a pause is needed to bring about more citizen engagement. Hearing no objection, Chair Hack moved to BOARD BUSINESS. Resolution: Caron clarified the intent of the resolution. Opposition - Cost of Labor/ Teenage Jobs: Shiraki expressed opposition to the resolution, commenting that small business owners would not be able to afford the cost of labor, adding that this would especially impact working age high school students. Support - Intent/ Cost of Living/ Myths: Frost expressed support of the resolution, commenting that a minimum wage is intended to function as a living wage, not as a training wage for teenagers. He commented that senior citizens and parents make up a significant portion of minimum wage earners. Frost commenting that a contributing factor to the high cost of living in the State is the minimum wage falling behind the cost to live. He added that, contrary to the idea that a minimum wage raises unemployment and causes businesses to close, raising the minimum wage increases the disposable income of its recipients. He commented that this income is good for businesses and the State. Opposition - Rebuttal: Shiraki expressed concerns that currently senior citizens would not be hired if the minimum wage increased. He added that a minimum wage is intended as a starting pay for teenagers. Research: Nakayama expressed concerns with the lack of substantive discussion, commenting that the Board ought to do more research before voting on the issue. Nakayama commented that an increase of minimum wage is significant and ought to be considered more deeply. Farm moved and Vice Chair Mau seconded to defer the item to the next meeting in April 2019. Time and Prevalence of Issue: Frost commented that the Board should not defer to better make an informed decision at the next meeting, citing the month the Board had access to the resolution and the prominent discussion of increasing the minimum wage at large. He added that the bill related to the minimum wage will be beyond influence by the next meeting. Minimum Wage History: Resident Dave Farrell reported that the minimum wage was originally 32 cents, having been raised 32 times nationally since its inception. He commented that, despite popular arguments that minimum wage hurts jobs, small businesses, and inflates the economy, these fears have not come about in any of the 32 times the minimum wage was raised. He commented that small businesses tend to fare better when the minimum wage increases. He added that wealth inequality in America is similar to that prior to the Great Depression. He elaborated that those who do not make a living wage tend to borrow to survive. In times of economic difficulty, those borrowers can no longer do so. He continued that these businesses invest less in the economy when there are fewer profit incentives, and eventually lead to layoffs. He concluded that a living wage threatens small businesses. Temporary Residents - Living Wage - Skilled Workforce: Resident Claire commented that Hawaii has a problem with temporary residents due to the high cost of living and low paying job. She commented that maintaining a skilled workforce in the community requires paying a living wage. She concluded that a living wage is an investment in the community. Citing time constraints and hearing no objections, Hack deferred items other than Approval of Minutes to the next meeting in April 2019. Late Mail Out: Shiraki expressed concerns with the late arrival of the mail out, and the Neighborhood Assistant commented that their physical mail policy has not changed. He suggested that there may be an issue on the postal end. Honolulu Prosecutor's Office: Resident Tae Kim announced his candidacy for Honolulu Prosecutor's Office. ADJOURNMENT: The meeting adjourned at 9:10 p.m.